The selection of the relative proportions of cement, water and aggregate is called 'mix design' Basic requirement of a good concrete are workability, strength, durability and economy. Depending upon the intended use the cement may be OPC (33,43 & 53 Grade), Rapid hardening cements Portland slag, Portland pozzolona etc. High cement content give rise to increased shrinkage, creep and cracking. Minimum cement content is 300Kg/m3 and maximum being 450Kg/m3 as per Indian code. Mineral additives like fly ash , silica fume, rice husk ash, metakoline and ground granulated blast furnace slag may be used to reduce micro cracks . The aggregate used is primarily for the purpose of providing bulk to the concrete and constitutes 60 to 80 percent of finished product. Fine aggregates are used to increase the workability and uniformly of concrete mixture. Water used for mixing and curing shall be clean and free from oil, acids, alkalis, salts, sugar etc. The diverse requirements of mixability, stability, transportability place ability, mobility, compatibility of fresh concrete are collectively referred to as workability. Compressive strength of concrete on 28th day after casting is considered as one of the measure of quality. At least 4 specimens of cubes should be tested for acceptance criteria. Steel bars are often used in concrete to take case of tensile stresses. Often they are called as rebars, steel bar induces ductility to composite material i.e reinforced concrete steel is stronger than concrete in compression also. Plain mild steel bars or deformed bars are generally used. Due to poor bond strength plain bars are not used. High strength deformed bars generally cold twisted (CTD) are used in reinforced concrete. During beginning of 21st century, Thermo-mechanical tream (TMT) bars which has ribs on surface are used in reinforced concrete. Yield strength of steel bars are denoted as characteristic strength. Yield strength of mild steel is 250MPa, yield strength of CTD &TMT bars available in market has 415 MPa or 500 MPa or 550MPa. TMT bars have better elongation than CTD bars. Stress-strain curve of CTD bars or TMT bars do not have definite yield point, hence 0.2% proof stress is used as yield strength. 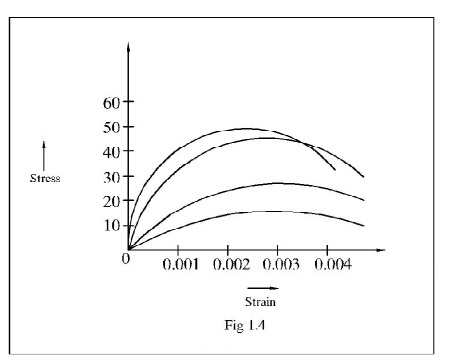 Fig 1.5 shows stress strain curve of different steel grades. Steel grades are indicated by Fe followed by yield strength. In the drawings of RCC, denotes MS bar and # denotes CTD or TMT bars.